Recently, the European Union issued a "2025 strategic road map (The Strategic Roadmap)", the road map shows the European photo of the European lighting market in the next decade (2015-2025) the development of a new vision. 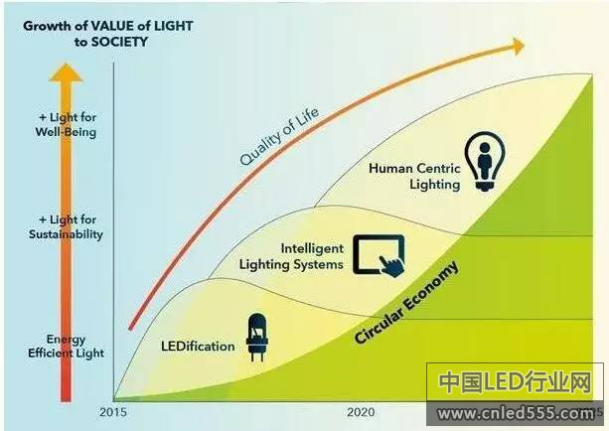 With the emphasis on energy, the European Association believes that through the product, intelligent lighting systems and people-centered recycling economy to enhance the quality of lighting will become the new driving force for the growth of the European lighting market. The following will be divided into several parts to introduce the road map for the lighting industry practitioners reference. 1. Lighting industry is the driving force to improve energy efficiency, people spend about 90% of the time in the building. 2. Workers' health and safety interests are not seen as an annexary value, and they are best served as part of energy conservation. People live and work longer and longer. By 2020, 41% of the EU people will live longer than 50 years of age. 3. Power saving potential. 60W incandescent lamp replaced with 6W LED lamps (134lm / W), compared to the situation in 2009, will save 90%. And then replace the 134 lm / W lamps with 200 lm / W lamps, which will save 6% (2 W). Significant additional energy savings will be done through special applications in the lighting system. European lighting industry in the lighting system technology and people-oriented lighting in the field of leadership in the world. The European Union and its member states support the European lighting industry to maintain its current position. Improve the idea of ​​"invent and manufacture in the EU"; gain more attention from more European factories and research climate agencies; develop the economy to promote the development of the industry. Through the people-oriented lighting and lighting quality, in the indoor and outdoor to create a gradual increase in the sense of happiness of life.